Six hundred Ross 308 male broiler chickens were used to study the effect of licorice extract and the prebiotic, fermacto, on performance, blood metabolites and gastro-intestinal transit time (GTT) of feed in the birds. The birds were fed according to a three phase feeding programme on a starter, grower and finisher diet during the ages of 1 - 14 day, 15 - 35 days and 35 - 49 days of age, respectively. 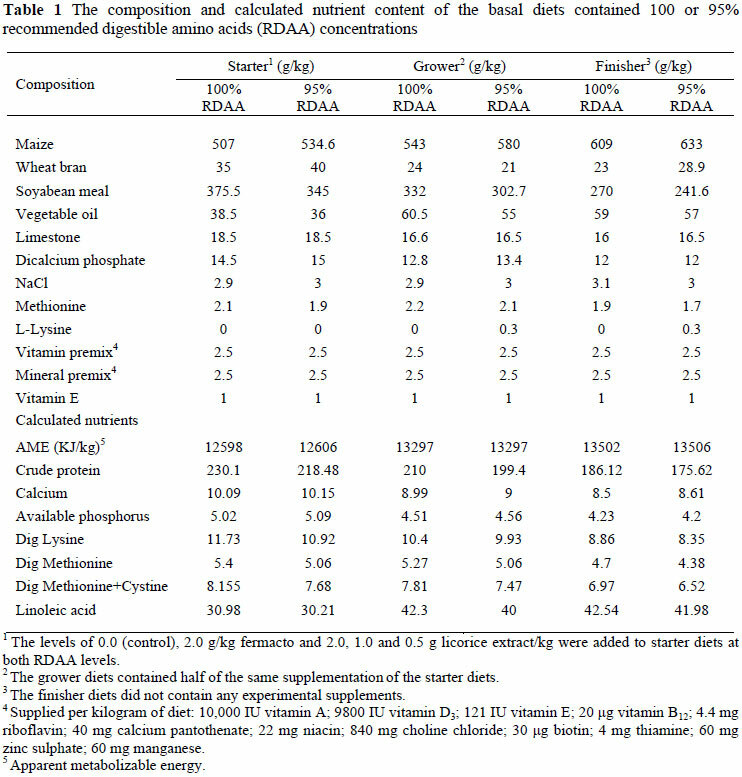 The basic diets during each phase contained either 100 or 95% of recommended digestible amino acid (RDAA) concentrations. The two basic starter diets were divided into five treatment diets: No supplement (control); and supplemented with 2.0 g fermacto/kg; and 2.0 (high); 1.0 (medium) and 0.5 (low) g licorice extract/kg diet. In the grower diets half the levels of these supplements were included, while the two finisher diets were fed without containing any of the experimental supplements. There was not a significant difference in body weight, feed intake and feed conversion ratio between the birds fed the control and the diets supplemented with the prebiotic or the different levels of licorice. However, birds receiving diets containing licorice extract had lighter abdominal fat pads compared to those fed the prebiotic or control diets. Blood cholesterol concentrations decreased significantly in birds receiving the high level of licorice in their starter and grower diets as compared to the control. The GTT of feed in the birds fed diets containing the prebiotic or licorice extract did not differ from that of the birds in the control. A 5% reduction in dietary RDAA concentration caused an increase in feed conversion ratio of chickens on the starter and grower diets and for the total duration of the experiment. Herbs' spices and various plant extracts have proven to be possible candidates to replace antibiotic growth promoters in animal diets. Licorice, the root of the leguminous glycyrrhiza plant species, Glycyrrhiza glabra, has been used as a medicinal product for over 4000 years (Shibata, 2000). It has been reported that licorice has anti-microbial (Fukai et al., 2002a), anti-helicobacter (Fukai et al., 2002b), anti-atherosclerotic (Fuhrman, 2002), anti-oxidative (Vaya et al., 1997), anti-inflammatory (Yokota et al., 1998), anti-fungal (Sato et al., 2000), oestrogen-like (Somjen et al., 2004), anti-viral (Fiore, 2007), anti-infective (Nowakowska, 2006), anti-nephritic and radical scavenging activities (Fukai et al., 2003). Human studies suggested that licorice flavonoid oil (LFO) is a safe functional food that can be consumed for extended periods or at excessive intakes with a potential weight-reducing effect (Tominaga et al., 2006). They indicated that LFO reduced body weight by decreasing body fat mass in humans. Aoki et al. (2007) showed that LFO reduced body weight gain and abdominal white adipose tissues in mice fed high-fat diets. Furthermore, in other studies licorice hydrophobic flavonoids decreased abdominal fat in humans and mice (Armanini et al., 2003; Nakagawa et al., 2004). Plant herbs or their extracted oils containing terpenoids, may improve poultry health and production. The effects of licorice extract have been evaluated in vitro and in laboratory animals but its influence on poultry performance has not been documented. Fermentation products such as prebiotics have been used in poultry diets. Prebiotics enhance gut development, digestive efficiency, gut beneficial bacteria, and duodenal and jejunal villi height (Harms & Miles, 1988; Hirayama et al., 2000), and increase body weight and improve the feed conversion ratio (FCR) (Khaksar et al., 2008). High prices of protein and environmental concerns have forced the poultry industry to reduce dietary protein levels. Moreover, recommended levels of nutrients for animals focus on maximizing performance, and many of the currently used feed additives in animal feeds aim at enhancing nutrient utilization by means of diverse mechanisms. It seems as if birds may compensate for a marginal decrease in digestible amino acid levels in their diets through the actions of feed additives such as prebiotics and licorice extract. Furthermore, reducing the level of protein and amino acids in diets below recommended levels has potential environmental benefits (Rodriguez et al., 2005). 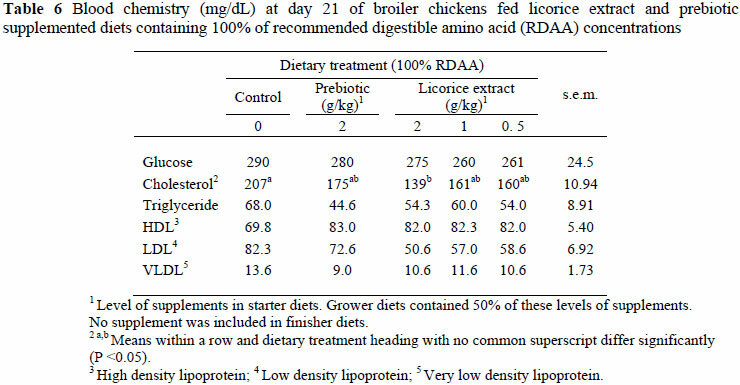 The objective of this experiment was to determine the effects of dietary supplementation of licorice extract derived from wild growing herb in Iran and the prebiotic, fermacto, on performance, blood metabolites, fat digestibility and digestive organ size of broiler chickens fed diets containing different levels of digestible amino acids. This experiment was reviewed and approved by the Committee on Animal Research of the Ferdowsi University of Mashhad, Mashhad, Iran. Six hundred day-old male chicks (Ross-308) were obtained from a commercial hatchery, weighed on arrival and randomly assigned to 50 floor pens of 12 birds each. Housing temperature started at 30 - 32 ºC for the day-old chicks and decreased at 2.5 ºC per week to reach 20 - 22 ºC at d 28 from when the temperature was kept constant to the end of experiment (49 d). The lighting cycle was 24 h from days 1 to 3 and a 23 : 1 h light : dark cycle until the end of the experiment. Maize-soyabean meal-based broiler diets were prepared following the instructions of the Aviagen Company (2007) and the ingredient composition recommended by Leeson & Summers (2005). Two basic diets per phase were prepared to meet 100 and 95% of the recommended digestible amino acid (RDAA) allowances for the starter (1 - 14 d of age), grower (15 - 35 d) and finisher (36 - 49 d) phases of the study. Each starter diet was subdivided into five dietary treatments: The control with zero supplements; and diets supplemented with 2.0 g fermacto/kg or 2.0, 1.0 or 0.5 g licorice extract/kg diet. In the second phase the grower diets contained half the level of the same supplements as the starter diets. In the finisher phase the diets did not contain any of the experimental supplements. Each dietary treatment was randomly allocated to five pens of 12 birds each. Licorice extract and the prebiotic were obtained from Zagros (http://www.Zagros-licorice.com) and Javaneh Khorasan Companies (http://www.javanehkhorasan.com), respectively. No antimicrobial, anti-coccidial or in-feed enzymes were used in any of the experimental diets. Feed and water were provided ad libitum. All diets for each period were isoenergetic, but the 95% RDAA diet had ca. 5% less nitrogen as compared to the 100% RDAA diets. The ingredient and calculated chemical composition of the experimental starter, grower and finisher diets are presented in Table 1. Body weight (BW) and feed intake (FI) per group of birds were determined four hours after feed removal. The feed : gain ratios were calculated for day 1 to 14, 15 to 35 and 36 to 49. Daily mortalities were recorded and used to correct performance criteria. Gastrointestinal transit time (GTT) of diets was measured at d 16 by covering the pen floors with clean paper 4 h after feed withdrawal and measuring the time between the offering of the diets containing 0.3% chromic oxide (Cr2O3) and the appearance of on average three spotted green excreta in each pens. The floors were covered with clean papers and excreta were collected for lipid digestibility determination after the birds consumed the chromic oxide diets for 48 h. A sample of the diets and excreta from each pen was stored at -20 ºC for further analysis. Lipid concentration of the diets and excreta samples was determined by Soxhlet extraction (Soxtec System HT 1043 Extraction unit) according to the standard procedure of analysis (AOAC, 1996). Chromium in the diets and excreta was determined using the dry ashing procedure of Miller-Ihli & Greene (1992). At days 21 and 49 one chick close to the average replicate weight from each pen fed 100% RDAA was selected, weighed and killed by cervical dislocation after 4 h fasting to determine the weights of the breast, legs, abdominal fat pad, liver (with gall bladder), heart, spleen, bursa and total tract. At 21 d of age blood samples were taken from the wing vein of chickens fed 100% RDAA. Glucose, triglyceride, cholesterol, HDL, LDL and VLDL concentrations in serum were measured enzymatically using an auto-analyzer (Selectra E, Vital Scientific, Netherland). White blood cell (WBC), red blood cell (RBC), lymphocyte, monocyte, heterophil and eosinofile counts were determined based on the procedure of Gross & Siegel (1983). One hundred leukocytes (WBC) were counted on one slide prepared from the blood of each bird to calculate the proportions of heterophil and monocyte and heterophil : lymphocyte ratios in blood plasma. Where µ = the common mean, Ai = the effect of feed additive and eij = the random error. Tukey's test was applied to compare the treatment means when the treatment effect was significant at P <0.05. 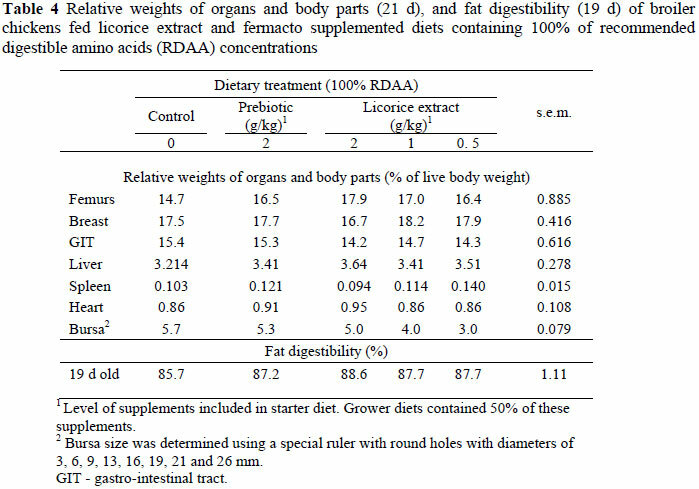 Orthogonal contrasts were used to compare the RDAA level, prebiotic and licorice extract effects on all criteria. All data were tested for normality prior to analysis. Abnormal data were transformed and then analyzed. The linear and quadratic effects of licorice on performance, blood chemistry, carcass cuts, cell blood counts and gastrointestinal transit times were not significantly different during both the starter and grower periods (data not shown). Thus, only the results of ANOVA analyses for all criteria are shown and discussed. The effects of different levels of the licorice extract and the prebiotic on performance parameters, GTT of feed and their orthogonal contrasts on broiler chickens fed diets with 100 and 95% RDAA are shown in Tables 2 and 3, respectively. The additions of licorice extract or the prebiotic did not have a significant effect on BW and FCR during the starter, grower and finisher periods. However, previous studies with other species of animals have shown that licorice flavonoids suppress BW by reducing body fat mass (Armanini et al., 2003; Nakagawa et al., 2004; Tominaga et al., 2006; Aoki et al., 2007). They suggested enhancement of fatty acid oxidation and reduction in biosynthesis of fatty acids are possible mechanisms for the reduction of abdominal fat and lower body weight gains (BWG). Lee et al. (2003) investigated the effect of thymol and carvacrol on the performance of female broiler chicks. Dietary carvacrol reduced BWG, while FCR improved as compared to control or thymol fed birds. The result of other studies using prebiotics indicated improved BWG and FCR in broiler chickens (Rodriguez et al., 2005; Khaksar et al., 2008). Mean feed GTTs (minutes) were not influenced by fermacto and licorice extract concentration (P >0.05) at d 16 and 42, though the GTT of feed in diets containing the licorice extract was higher than in the control diets (P <0.054). Mean GTT of feed at 42 days of age was longer (P <0.01) than in the chickens at 16 d of age (205 vs. 168 min). That may be due to improvement in gastro intestinal track function and movements. The results of GTT were contrary to the report by Khaksar et al. (2008) who found that the addition of a prebiotic to broiler diets decreased the GTT of the feed. A 5% decrease in dietary RDAA concentration suppressed (P <0.05) BWG during the 15 - 35 d period and numerically decreased BWG during 1 - 14, 35 - 49 and 1 - 49 d of age. Birds fed diet with 100% as compared to 95% of RDAA had a lower FCR during the starting (1.54 vs. 1.66), growing (1.89 vs. 1.96) and total (1.89 vs. 1.98) periods of the experiment (P <0.05), although the FCR of broilers fed the diet with 95% of RDAA was unaffected in the finisher diets (Table 3). This result suggests that a finisher diet containing 95% RDAA has no negative effect on the FCR of broiler chickens. 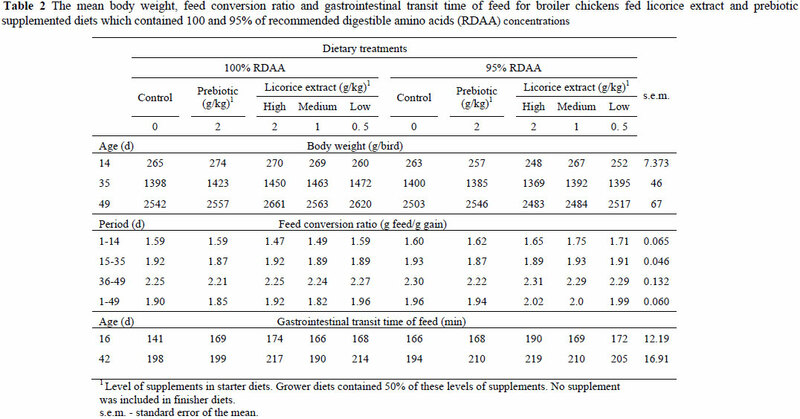 The relative weight of organs and body parts (21 d) and fat digestibility (19 d) of broiler chickens fed licorice extract and fermacto supplemented diets with 100% RDAA are shown in Table 4. At 21 d of age there were no significant differences in breast, femur, liver, heart, spleen, bursa or whole gastrointestinal track weights of the birds fed the control or diets containing the prebiotic or the licorice extract. The breast meat yield clearly responded to the diets with different digestible amino acid concentrations (Rostagno et al., 1995). Miorka et al. (2001) added prebiotics to broiler diets and did not find any effect on carcass, legs and breast yields which are corroborated by the results of the present study. However, according to Khaksar et al. (2008), breast yield was increased (P <0.05) with fermacto supplementation of diets at either level of 100, 95 and/or 90% RDAA. At day 19 fat digestibility was not influenced by the addition of prebiotic or licorice extract (P >0.05). Similarly, Cross et al. (2007) found that the supplementation of broiler diets with some medicinal herbs (oregano, rosemary, thyme and marjoram) and their essential oils did not have any effect on nitrogen-corrected apparent metabolizable energy and digestibility of organic and dry matter. However, Hernandez et al. (2004) showed that a mixture of plant essential oils or plant extracts improved fat and dry matter digestibility. 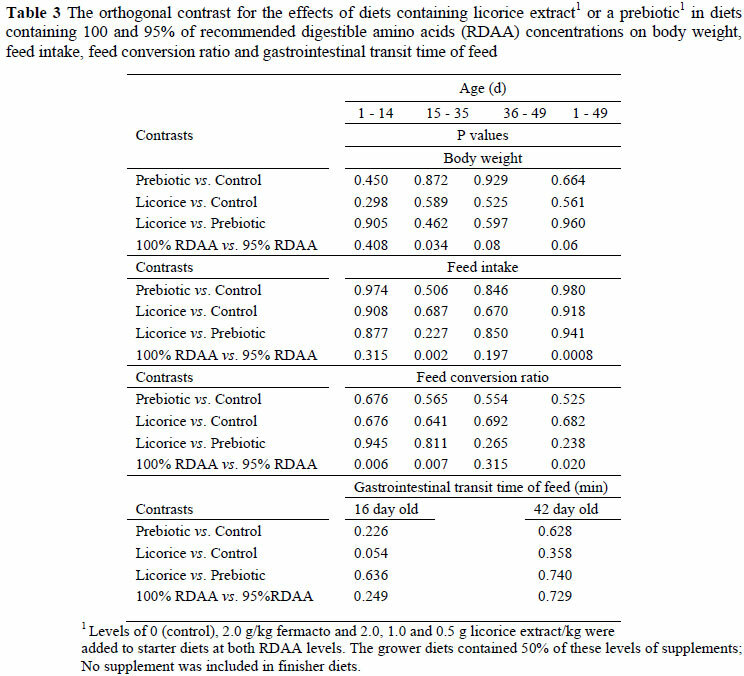 At day 49 birds fed the diets supplemented with licorice showed lighter (P <0.05) abdominal fat pads as compared to those fed the control diet (Table 5). Previous studies also showed that licorice flavonoids reduced the abdominal fat in other species (Armanini et al., 2003; Nakagawa et al., 2004; Tominaga et al., 2006; Aoki et al., 2007). Tominaga et al. (2006) indicated that the effect of licorice on reduction of abdominal fat could be due to factors such as suppression in energy intake, reduction of lipid absorption, enhancement of fatty acid oxidation or reduction in biosynthesis of fatty acids. There was not a significant change in energy intake since feed intake between treatments in the present study did not differ (Table 2). Also, lipid absorption and serum triglyceride concentration were not affected, as shown in Tables 4 and 6, respectively. Therefore, the enhancement of fatty acid oxidation and reduction in biosynthesis of fatty acids could be a possible mechanism for the decreased abdominal fat. A study on mice fed licorice showed that licorice altered some fatty acid oxidation and synthesis pathways (Tominaga et al., 2006). The abdominal fat pad was unaffected by dietary fermacto supplementation, which is contrary to results reported by Khaksar et al. (2008). The feeding of licorice and the prebiotic did not have a significant effect on serum glucose, triglyceride, VLDL and HDL concentrations, whereas cholesterol (P <0.05) and LDL (P <0.07) concentrations decreased in birds fed licorice compared the control (Table 6). This could be due to actions of licorice such as protecting of LDL cholesterol from oxidation, inhibiting cyclooxygenase and lipoxygenase enzymes and inhibiting lipid peroxidation (Craig, 1999). White blood cell numbers increased (P <0.05) in birds fed diets containing 1.0 and 0.5 g licorice/kg in the starter and grower stages, respectively, compared to those fed the prebiotic containing diet (Table 7). The two dietary additives did not have significant effects on heterophil, monocyte and lymphocyte percentages, the heterophil : lymphocyte (H/L) ratio or red blood cell proliferation. The addition of licorice extract to broiler diets may reduce abdominal fat content and serum cholesterol and LDL concentrations as compared to the control. Dietary licorice extract supplementation did not have any negative effects on body weight or FCR of broiler chickens.